Created by Brazil’s Companhia Hiato and written and directed by Leonardo Moreira, O Jardim playfully experiments with theatrical structure with vibrant and emotionally stirring results. At the play’s opening, the cast dissect the stage into three spaces, lined with large cardboard box structures which, along with an expansive grass turf, perform the function of set. The spaces form a diamond-like shape, each side facing a different section of the audience. Three scenes are performed simultaneously, one in each of the spaces, and rotate so that by the end, we’ve seen all three scenes albeit in different order. Each scene depicts one generation in a Brazilian family struggling to preserve its legacy and its past ideals about love, family, success, and youth. Chronologically first is a scene between Thiago (Thiago Amaral) and Fernanda (Fernanda Stefanski), ex-lovers who re-unite on Thiago’s birthday five years after their split. Thiago has already settled down with a new woman, but together they try to relive their past happiness and mistakes, disappointed with the insufficiency and inaccessibility of their memories. It’s a passionate and heavily poetic dialogue– the script allows for the characters’ interior thoughts to be spoken asides, greatly illuminating the play’s nostalgic tone. The second scene features Thiago as an elderly patriarch (Edison Simão) with Alzheimer’s and his two grown daughters with his second wife. In the last scene, Thiago’s granddaughter records video on her smartphone of some inherited family objects to preserve them for posterity (and gain her internet fame). The scenes echo each other with repeated phrases and images, and even interact with one another– Thaigo’s granddaughter bemoans about the neighbor’s incessant arguing, snapping a photo of Thiago’s and Fernanda’s angry attacks from the edge of her play area. O Jardim has a wistful, yet powerful energy, due in large part to the careful orchestration of its interwoven scenes and the beauty of its contemplative script. A (radically condensed and expanded) Supposedly Fun Thing I’ll Never Do Again, developed by Daniel Fish, emulates the writings of the late David Foster Wallace with a non-traditional theatrical piece focusing on the author’s frenetic, yet somehow meticulous, style and the labor-intensive experience of his readers. 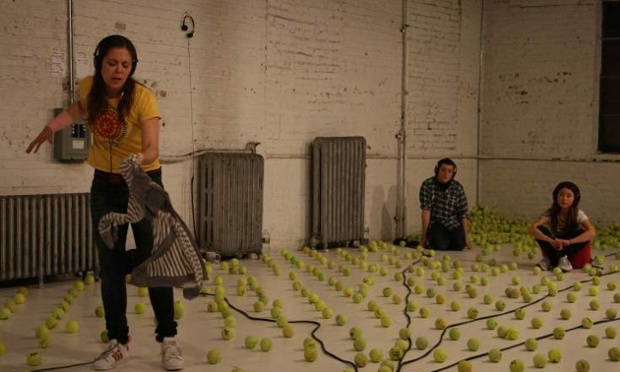 Four actors enter a stage covered in tennis balls, which have been shooting out from a ball gun center stage. Wallace was a tennis player and often wrote about the sport with a metaphysical approach. Much like Wallace’s writing, the balls are neatly organized in diagonal rows on the outskirts of the stage, but messy and haphazardly strewn in the ball gun’s path. The actors put on headphones which play an audio mixtape of excerpts from Wallace’s essay, novels, and short stories. The actors must recite what is being broadcast into the headphones word-for-word. However, the excerpts are mixed on the spot by the play’s crew so that the players lines are delivered to them at the instant they must recite them. The physical feat of reading aloud DFW’s work is tremendous in itself, let alone doing so on the spot in performance. His sentences are long and swirling, breaking off into tangents, subtangents, and yes, page-long footnotes, yet always retaining an elegance of structure and prose. The actors’ physical performances– one even recited hers while doing jumping jacks for at least ten minutes straight– reflect the reading experience of a David Foster Wallace piece. If you’ve ever read one of his works, you know the struggle to follow his writing, to remain present in the experience and clear your thoughts to make room for the immensity of his thoughts, is a difficult yet rewarding one. If you have had largely positive encounters with Wallace’s work, A Supposedly Fun Thing will certainly speak to you. However, the piece has little for those unfamiliar with or antagonized by DFW’s style, and if you count yourself in that group, you might find the piece’s long stretches of recitation and lack of action boring or impenetrable. A Supposedly Fun Thing plays through January 16. Tickets here. Comedian Ikechukwu Ufomadu delivers his deadpan take on the late night talk show structure with Ike At Night. Ufomado’s stage persona is an uncanny emblem of the anti-talk show host. At his best, Ike sounds a bit like a hesitant Barack Obama without a teleprompter– all hesitation and build-up that stumbles in delivery. And yet, there’s something quite charming about his get-up. His straight-faced, Johnny Carson-esque delivery of lines like, “You know, we’ve been doing this show night after night since last night” convinces you there could very well be a great entertainer behind his persona’s awkward quietude. The interview portion of the show was much more conventional and straight-forward. Robin Lord Taylor of Gotham fame and LGBT activist Todd Sears were guests on my performance night, and they gave great interviews about their work and current projects. I would have loved to see Ike pull this portion in a slighty different comedic direction however. One thing I felt the show as a whole could have benefited from was more developed material between Ike, his sidekick R. Brian Argotsinger, and DJ Jonathan Jacobs. By its conclusion, Ike at Night felt far more like a typical talk show than a satirical riff on one. Ike At Night plays through January 18. Tickets Here.